This game has a special RPG-atmosphere and some graphical particularities. It offers 50 levels in many variations. There are for example fortresses, airships, underwater-levels, episodes in a desert (where you can only move slowly), dark jungle-levels and many more different stages. Have a look at this new package of Mario's classical platform-fun! i haven't played it yet, but i'll try it very soon it looks like it has madly good potential, and a huge variety of gameplay, i'll PM you when i get down to playing it. and a full text review. Reviewed it. Hopefully accepted. I beat the game with 48 lives in 78 minutes and a score a little over 2000 (forgot the number), killed 300+ enemies and 130+ coins collected. Finaly you brought your cool game on MFGG. Ahoy! It's me Matthew, if you don't know me Ralpi89. Long time no see. Looks like a game with a lot of potiental. The graphics are a nice mix between Super Mario World, Mario Party Advance, and SMB3. The gameplay is pretty crappy imo, but seeing how this was made in rpg maker(I think) this is amazing. He did exert by presentation of the game(story, graphics etc.). The Engine seems to be much better then the old ones but this game is much more difficult as it´s predecessors. I even can´t beat the first level cause I´m falling in the holes all the time. You have to stand still and Then to jump. I´m used to jump while running too. Might I to accoustom to this. Hi, thanks already for those comments. @ FoxGuy : There's a possibility to upload the score ;-). @ Matthew : Of course I do remember you ;-). @ TouchFuzzy : Yeah, it's made with the RPG Maker. @ Kevin Triebel : It takes a few minutes to get used to the gameplay. Afterwards it shouldn't be too difficult. @ LocoRoo : I think it's more interesting do make it with the RM than with a usual Platformmaker. It produces another atmosphere which I like very much. Don't EVER make platform games in RPG Maker. EVER. You'll get used to it. The first time I started thought "what kind of platform is this!?" Yes you can jump while running but you have to press the button early, a square or two. This is making me want to play some retro MFGG platformers. Excellent Game play, tons of Variety, although i thought the jumping control took alot to get used to, althoung it's still an excekkent game to play and an excellent Platfrom/RPG mix, i have to say the Graphics are my Favorite in any Mario Game Super Mario Bros. 3 9/10 for Visuals. the soundtrack it self is excellent all the way, it's just a huge remix of all the music from Super Mario RPG legend of the Seven stars. Sound 10/10. Gameplay has never before been so welly made as to a MFGG game, it's jump is a little tricky but still a awesome game you owe your self a chance to play. bad points, terrible hard to get uses to jump, a lack of vareity dury DKs Mini Games, and a whole lot of missing Power-ups features, the good, tons of levels, gameplay, bosses, sounds. overall 9.5/10 Excellent. This is ok for being made in RPGMaker. Wait... what RPGMaker was used to make it? And where's the first five? I saw 6 on here. @ magickoopa-marc : It takes a bit to get used to the gaemplay, you have to hold the key to jump further. @ Mario 6464 : Thanks. @ Ninji Fan : RM2k. Number 1-5 weren't translated into English ; they were also all in the same style as I didn't really try to improve them xD. I cant get past the first jump. And Space/Enter doesnt work. Don't they o_O? Try the other keys, if you don't make a short jump with 'A', you should try to delete the game and download it again. The jumping was better in this game, but not that much easier. I think you should try using Hello's engine for platformers. RPG maker isn't getting you anywhere closer to making a game that acually feels like a mario game. I want to like it, but the feel of the game won't let me like it. 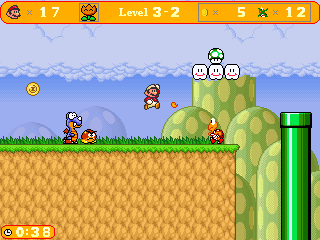 You should make another mario pc challenge game. ARE YOU SURE ABOUT THAT??? ?